Trikonasana means triangle pose. Tri means three and asana means pose. It is a good asana to bring stability of mind and stamina in our body. It helps in strengthening of core muscles and legs. 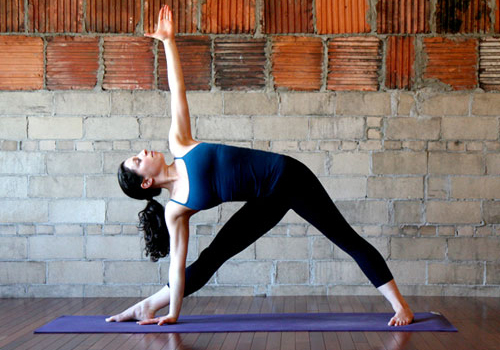 This asana can be performed at any time of the day. Turn the right foot facing outside around 90 degrees and left foot inside towards you around 45 degrees. The arms should spread outside in align with shoulders and parallel to ground. The trunk is bent towards the right side till the right arm touches the foot of your right leg with palm touching the ground while inhaling. The left arm is moved upward facing the sky. Keep straight. Turn the head towards the left hand seeing the sky. Breathe normally. Hold the position as long as possible. Repeat the same for left side. Keep both the legs knee straight. For beginners they may bent little till they are used to this asana. Stretches spine muscles and helps in stimulating spine nerves. Helps in digestion, gastric problems, acidity, and flatulence. Reduces stiffness in neck, knee, and ankles and strengthens the pelvic areas. Reduces blood pressure, stress and anxiety. Keeps mind calm and focused. Helps in reducing the fat accumulated all over the body. Helps in proper functioning of the internal organs as this asana stretches whole body. People with slip disc or back pain should avoid doing this asana. People with any surgery should consult a physician before doing this asana. Pregnant ladies should consult physician before doing this asana.